In one of the greatest cities in the world, New York City, stands a symbol of freedom for the people of the United States of America: the Statue of Liberty. The Statue of Liberty is not merely a large statue of a woman standing in the middle of a body of water, it embodies the idea that the people of the United States of America have freedom and a voice in their own country. The full name of the Statue of Liberty is Liberty Enlightening the World and it was presented to the United States as a gift from France in 1886. The original sculptor was Frederic Auguste Bartholdi and the gift was proposed by French President Edouard Rene de Laboulaye. A significant female icon in the eyes of the American people was the goddess of freedom, who was commonly represented in ancient Roman mythology. The decision to use the goddess of freedom, Lady Liberty, as a symbol for freedom was not initially accepted with great enthusiasm, but over time politicians and government officials grew to like the idea. 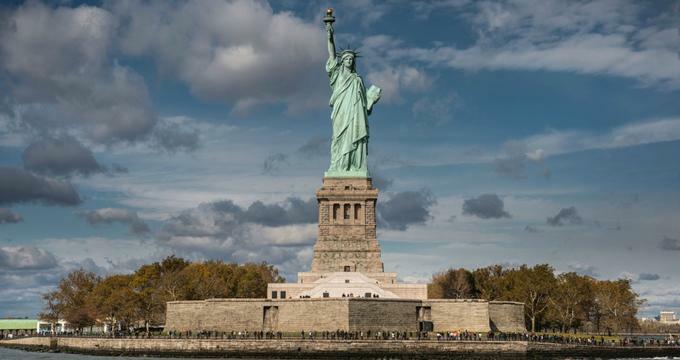 The construction for the statue began in France and pieces were brought to the United States to be assembled on Bedloe's Island, today known as Liberty Island. The Statue of Liberty was first opened to the public for viewing on October 28, 1886. In 1984, UNESCO named the Statue of Liberty a World Heritage Site. Standing over 111 feet and 6 inches tall from the heel to the top of the statue's head, this symbol of freedom needs a lot of care and attention to maintain its beauty. From the ground up, the statue actually stands at 305 feet and 1 inch, and was the tallest structure in New York when it was unveiled. Originally over 450,000 pounds, the statue has become eroded due to bad weather conditions and so restoring parts of it has been absolutely necessary. The torch held in the right hand of Lady Liberty was restored in 1986 and completely covered in 24k gold to accent the greenness of the statue. There are many inscriptions on the Statue of Liberty, the most well-known being the one on the tablet held in the left hand of the statue, namely the date of the American Declaration of Independence, July 4, 1776. The seven spikes on the crown represent the seven oceans and the seven continents of the world, uniting Lady Liberty with the world, while the shackles located at the base of the statue’s feet are broken in order to signify freedom from oppression. A tablet held near the Statue of Liberty has the inscription of the designer's name, Bartholdi, as well as an inscription that reads “the Alliance of two Nations in achieving the Independence of the United States of American and attests their abiding friendship” to forever commemorate this amazing gift from the people of France to the American people. Between 1984–1986 and 2011–2012, the Statue of Liberty was conserved and restored. During these years, the statue was cleaned, polished, and restored as much as possible to bring it back to its original glory. Unfortunately, due to the terrorist attacks on September 11, 2001, the Statue of Liberty was closed off to visitors. The island reopened that year, but access to the pedestal was restricted for the next 3 years and the statue remained off-limits for a further 8 years. In October 2016, construction began on the Statue of Liberty Museum, also located on Liberty Island. This museum is set to open in 2019, and will include a theater where an aerial view of the statue can be seen. Although events in the world today have left public monuments more susceptible to terrorist attacks, the commissioners for the Statue of Liberty have tried to keep events ongoing at Liberty Island. Free ranger-guided tours are available at Liberty Island on a daily basis. Statue cruises are also available through ferry services. Night tours of the Statue of Liberty are only available by ferry, held once a week during the spring and summer months. Private events can be held at Liberty Island, but require prior approval from the NPS. Since the Statue of Liberty is located on Liberty Island, the only access is by ferry. Battery Park in New York City and Liberty State Park in Jersey City offer ferry rides that run on a daily basis.